Check out the new crop of hot college men in Katipunan, and find out what kind of gal they'll bring home to mom and dad! Could it be you, Cosmo chick? After visiting Taft Avenue to spot the new batch of Lasallian hotties, Cosmo, of course, had to pay a visit to their rival school in Katipunan to see the kind of eye candy that girls in Ateneo are treated to daily. The Cosmo team was not at all disappointed! Ateneo is certainly brimming with cute boys, which we spotted all over campus. We picked out a number of guys who truly stood out from the rest of the pack, and got to know them a little better by asking: What kind of girl would you bring home to meet your family? 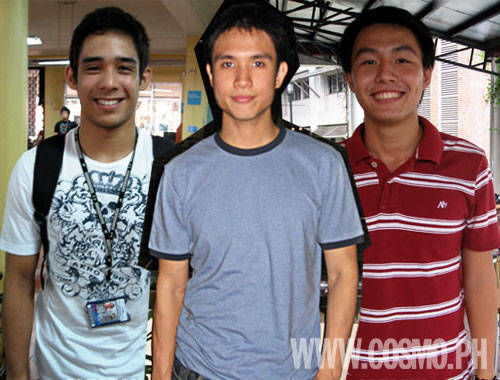 Check out the gallery to see for yourselves if these Atenean cuties meet the grade. Pick up a few pointers, too, on just what guys look for in girls that make them worth introducing to mom and dad. See if you fit the bill.